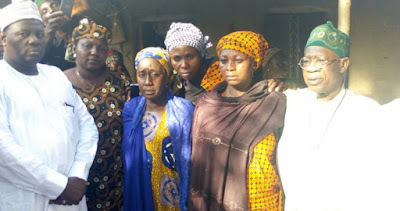 A Federal Government delegation led by the Minister of Information and Culture, Alhaji Lai Mohammed, has visited Mrs Rebbeca Sharibu, mother of Leah Sharibu, the only Christian Dapchi girl still in the custody of the Boko Haram insurgents at Dapchi, Yobe State. Alhaji Lai Mohammed who was on Friday accompanied on the journey by the minister of State Foreign Affairs, Hajiya Khadija Bukar Abba Ibrahim and the minister of Women Affairs, Aishatu Abubakar re-assured the traumatized mother of the Federal Government’s commitment to rescue her daughter. According to Lai Mohammed, the Federal Government has employed both formal and informal channels to ensure the safe release of Leah Sharibu and others in captivity of Boko Haram. Lai Mohammed however disclosed that government can not disclose publicly some of the efforts being made to secure the release of Leah and others, stressing that “we are appealing to them using both formal and informal channels to spare the lives of this innocent people. “I want to plead with the federal government to please make a way for my daughter’s release, because I was told they kill them all by 15th of this month if federal government did not agree to their request. Since I heard of this, I find it difficult to eat," Rebecca appeal. “We also appreciate the sense of belonging and assurance accorded to the community by the federal government," he said. President Buhari had two week ago called Mrs Rebecca Sharibu and gave her assurance of the release of her daughter.